How much is understood by scientists about Titan? There have been many instances where scientists never discover what they had predicted. The data defies long-age assumptions, thereby increasing the complexity within their framework rather than confirming it. Saturn’s giant moon Titan keeps on revealing mysterious and fascinating discoveries. NASA’s Cassini spacecraft finds a river on Titan comparable to that of the Nile river on earth. However, Titan is too cold (-179) to allow flowing water rather it’s ethane and methane which fill the lakes and streams on Titan. It is interesting to note, even though scientists don’t believe Titan has plate tectonics, they do however believe the river tracks a fault line! Sounds complicated, doesn’t it? In another discovery found on Titan, the moon is icier than previous thought! Titan’s data conflicts with long-age assumptions, for example…Its lack of craters and the craters are shallow which is hard to believe using long-age assumptions considering the moon contains the most gravitational pull. Jupiter’s moon Ganymede, is a comparable size to Titan, but yet its craters are hundreds of meters bigger! These gases are formed by sunlight, which then are converted by Titan’s atmosphere into benzene and hydrogen cyanide. The researchers were very surprised by this discovery considering such a rapid change within just a few short months. Why wouldn’t a circulation model predict activity even being relatively close to that high level? Well, it goes back again to the long-age assumption which prevails in secular science that bases everything on how things evolved. This discovery causes a problem for that assumption because they will have to invent something on how this erosive process could have been sustained over Titan’s presumed billions of years! Every so often, one finds new papers which modified old papers that have been falsified such as the prediction of a global ocean being on Titan. A new model was invented and then presented in Icarus (which should be free) where they calculated (using only ratios, not bulk quantities) that surface liquids should be dominated by ethane (56%) over methane (32%), with much lower concentrations at the poles. This counters actual observations on Titan, where the only lakes found are at the poles! Everyone can agree that observational raw data is vastly superior to invented speculation! We learn something about what is out there in space, we don’t really learn anything with speculative models other than they require fixing all the time to rescue the overall theory. But when you believe in a young universe, these amazing discoveries do not increase the complexity of that! One marvels on how Titan continues to confirm creationism, while defying secular speculation! Did Earth’s Oceans Come From Asteroids? For many years, secular planetary scientists believed condensation from the solar nebula, or comets were responsible for the earth’s oceans. And it would be easy to assume this considering comets are mostly ice which is why it became a popular idea for many years but with direct observations suggests something different. These direct observations of comets were conducted by the Stardust and Deep Impact which have shattered theories about the origin speculation of comets. Belgian planetary scientists back in 2009, discounted comets saying the earth is too close to the sun, that carbonaceous chondrites contain water sufficient to create a “veneer” of water after the Earth cooled, but observational data of ratios containing osmium isotopes do not match! Also, other researchers have discovered that nitrogen isotope ratios differed significantly between comets and Earth’s atmosphere! In Astrobiology Magazine… “Observations from this sample are changing our previous thinking and expectations about how the solar system formed,” a Stardust mission researcher said. What about condensation from the local solar nebula? That is also dead too. Inventing models that suggest the earth is dryer than expected, the so-called “snow line” in planet formation theory is now thought to be even farther out than previously believed which means the water had to be delivered by something. With everything else discounted, what is next? Their latest option which is out of desperation more than anything else is trying to fit asteroids into the materialist framework along with its difficulties as the source and deliver of the earth’s oceans! An implication is not a theory anymore than a constraint, generally ad hoc explanations are not scientific. Because of the desperation with basically no other options left (but that doesn’t mean they could never invent more), there were no calculations on how many asteroids it would take to create the earth’s oceans. Asteroids have more of a problem than comets, because unlike comets which are mostly made of ice, asteroids are mostly made out of rock. It would take an enormous amount of asteroids to squeeze out carbonaceous chondrites, in fact the earth would have to be covered and this would most certainly be detectable if it happened. Also the timing and size of the asteroids would have to be accurate because volcanoes would have to cease from being so active that the asteroids would avoid being buried in lava and the size is important too! Too big and the asteroids would boil up the oceans! So did the earth’s oceans come from asteroids? Clearly, not! It was a last-ditch effort to find something in the universe to rescue their hypothesis that could deliver water to the earth in order to create the oceans as icy comets were discounted because of new direct data! It’s time they change their framework to intelligent design, namely God! Public education which also teaches Darwinism also teaches “geologic time” as a very long duration of time like millions of years. But reported through out this year in Darwinian publications, geology moves rather quite rapidly! In the beginning of the year, it was discovered that kimberlite eruptions, which enable diamonds from deep in the mantle to rise to the surface, are much more rapid than previously thought. They are talking about 10 cubic kilometers of sand erupting through these cracks quite rapidly. In the creationist model, the earth is young, and observing rapid geological processes confirms it! There is no adjusting those observations to an Ad hoc explanation in order to fit into its timeline. This isn’t going to be the last time you will hear of “more rapid than previously assumed” because there are other rapid processes out there which falsify the Darwinian of assumption of millions of years! Geophysicists have discovered that their most popular dynamo theory for the Earth’s magnetic field is not able to sustain itself over vast periods of time which leads them to square one in their evolutionary time frame with this question, “how did our planet retained its magnetic field for “geologic time?” There are mechanisms that can sustain the Earth’s magnetic field, but not for billions of years which confirms the creationist model of the Earth being much younger! How Do We Know Our Solar System Is Young? One of the most accepted hypothesis or theories in evolutionary science claim our solar system formed about 4.6 billion years ago. Many theories have been built around this assumption in order to make predictions of what is out there in space. On the other hand, the Biblical account implies a much younger solar system. Is there evidence for a young solar system? The answer is, “yes!” Evolutionary scientists call it a mystery while creation scientists call it a confirmation. 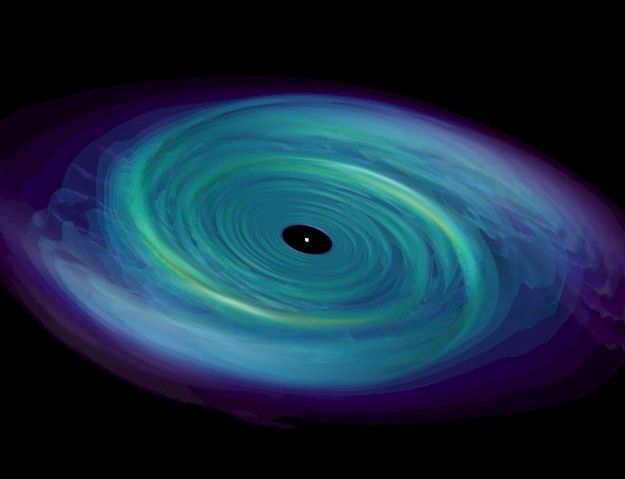 The old age framework claims an accretion disk appeared which gravity used to flatten into a spinning disk. From this disk over millions of years they claim, gravity caused planets to form and other objects. Once it reached a certain level or point, the excess gas and dust dissipated and cleared away, leaving the solar system as we observe it today. The disk, also known as a nebula then becomes the source from which everything in our solar system was formed. However as science advances, evidence for a young solar system has been causing problems with this hypothesis. Chemical-change is a good indicator on how old an object is. The Cassini mission with its probe has been one of the amazing tools for discovering what is going on in our solar system! For one thing, Scientists who have been modelling Titan’s atmosphere have made calculations using old-age assumptions concluded that no methane should be present on Titan rather it should have been used up in the first tens of millions of years of the moon’s history. There is some replenishment going on with the methane which is evaporating off Titan’s surface but not enough to account for the amount detected by the Cassini probe. There is a lot of chemical-changing activity going on which is why evolutionary scientists were surprised to find so much methane on Titan. Also, methane escaping Titan’s thick atmosphere into space lowers the ten million year range as well. The old-age assumption has encountered other problems with evidence for a young solar system. 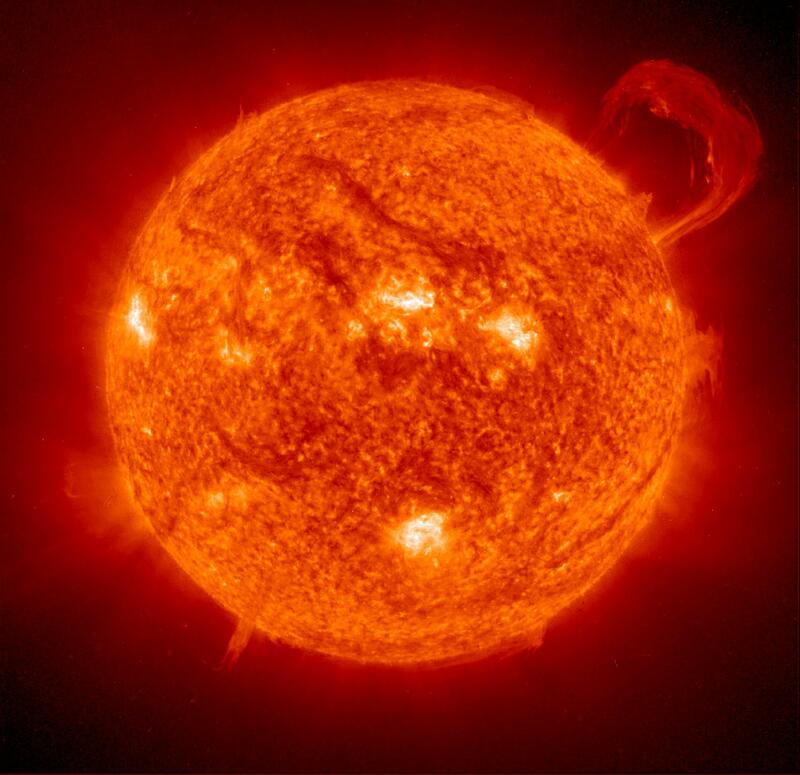 Such as our sun, where in the old-age model suggests 30 percent less of the total energy the sun gave out than it is now. This causes a problem with evolutionary expectations on how life began on earth because with 30 percent less energy being giving out by the sun, the earth would be like an ice-ball, thus making it impossible for earth to create or sustain life. This is known as the faint young Sun paradox. On a moon of Jupiter called Io, evolutionary scientists discovered another problem with their old-age assumption. 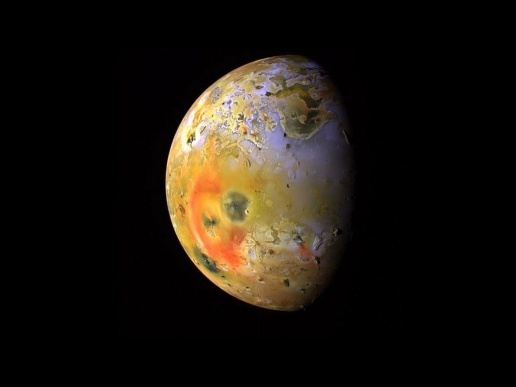 Io has an amazing array of many volcanoes that are much more active than Earth’s volcanoes. The heat given off by these particular volcanoes is much more than what Earth is producing. There was an expectation of volcanic activity with some heat but nowhere near the extent that was discovered because of the old-age assumption. As a result, two more assumptions have been invented to explain the falsification of the new discovery. One is, the interior of Io and the amount of heat generated by all the volcanoes and the other is massive tidal forces due to gravity from Jupiter that squeeze Io and cause its shape to oscillate, generating heat inside Io. However, the geology of Io is not a mystery and is more logical when thinking in terms of youthfulness because the processes work well if the heat present after Io’s creation is simply used up and dissipates over several thousand years! These are just a few examples on how we know our solar system is young rather than billions of years old. We observed, chemical-change on Titan that resembles its youthfulness, the sun being too cool to sustain life, and the heat from Io is another indicator. What an amazing solar system that was designed by God where we live in today! The moon remains intriguing, it’s specialized designed role on maintaining life on earth is quite remarkable. It has the correct size and exact distance required. Scientists lack a lot of data on how much uniqueness there is in regards with the moon’s relationship with the earth compared to the rest of the universe. Scientists also discovered the earth’s moon is being hit with “a massive cloud of plasma strikes” which removes material from the moon’s surface. These plasma strikes comes from solar flares that are ejected from the sun. Now Space.com reported that research created a model to learn the effect it had on the moon’s surface. What this study like about the moon is the consequences of this phenomena happening over the faulty assumed age of the moon which is 4.5 billion years. One would think that with all that sandblasting going on over that time that the surface would have undergone a considerable amount of rework. It would be a great way to demonstrate the real age of the moon, wouldn’t you say? One could do this by calculating the mass loss and change of appearance expected of the lunar surface experiencing CMEs, and see whether the calculation matches what was observed by the Apollo astronauts while taking into account the average frequency of CMEs striking the moon in 4.5 billion year time frame. But what they mean by “model” is to speculate rather than observe what is inside the moon. One article suggested the mission was to understand the moon’s mysterious evolution. However this is not the case, we will learn from the exploration of the moon which is great science, but learning nothing about interpreting it into how it supposedly evolved, only more questions with more invented speculation within that man-made story telling framework. Creationists should be excited about explorations in space like the moon, there is much to learn out there, no mystery about who or what created it. Last month, a special interest group know as NCSE went after creation geologists referring to them as people who interfere or meddles in the affairs of geology. One of the projects that creation geologists took on was called, “RATE” (Radioisotopes and the Age of the Earth) which took eight years to accomplish. It challenged the very idea of the earth being billions of years old while being able to scientifically verify (proving the Bible to be correct) that the Earth was much younger! Other criticisms of geological dating included consistency over a vast period of time. Opposition emerged and one of the sources was a man by the named of Greg Neyman from Answers in Creation who attempted to create a straw man, accusing creation scientists of being deceptive because the research was deemed good enough for peer-review publications. Greg then says, “The methods used by the RATE theorists in this research need to be questioned” or in other words come up with a straw man’s argument. This wasn’t about where the evidence lead in Greg’s article as far as the research was concerned but who was able to present it. Like many arguments in evolution, over a period of time it eventually gets falsified causing a variety of more complexity in the explanation. Geological dating is not immune from such falsifications as we shall see momentarily. For many years the undisputed champion with secular scientists has been microscopic crystals known as, “zircons” which are used for finding out how old the rock strata is. The method with the use of certain assumptions was very favorable to the idea the earth was billions of years old rather than thousands. It is has been recently discovered that zircons on the inside appear to be vastly different in age! Confirming what creation scientists have been saying for many years and along with RATE research, “Earth’s ‘Time Capsules’ May Be Flawed” Science magazine declares! About 7,000 zircons thought to be 2.6 to 3 billion years old came out to be 800 million years old. While this in itself doesn’t prove how old the earth actually is, but it does demonstrate the fact that zircons are not protected from outside influence as previously thought by secular geologists but confirms creationists view on the matter. Over the years, secular geologists have had a method that assumed their own timeline, and tossing out any anomalies but new research is making it harder for them to do that this time. Even disagreeing with creationists about the anomalies, they should have taken them more seriously instead of clinging to their own dogma that eventually bites them in the foot. The discovery for creationists is very exiting, and its great to see science improving in this area!